The current silence within the SEO industry is deafening. With Google’s mobile-friendly algorithm update fast approaching, it’s leaving many of us – agencies, clients and in-house digital marketers included – all unsure of what to make of it. The scepticism seems to be focused on whether the algorithm update will actually make a real impact on mobile traffic. However, with Google announcing that this update will significantly impact mobile search and Ait Bahajji stating how it’ll affect more sites than Panda or Penguin ever did, we believe it would be naïve of us to simply coast along whilst not preparing our sites for the potentially massive impact that’s on the horizon. With this in mind, we have prepared this risk assessment for site owners to work through. By working through these tasks, you will be able to establish whether you’re at risk from the mobile update and, if so, exactly what portion of your organic traffic is at risk. Task 1: Do you have a mobile-friendly label? This is perhaps the easiest preliminary check you can do. Grab a smartphone and do a quick Google search for your business. This can be either on the native Google app or by visiting Google on your mobile browser. 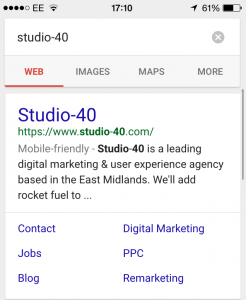 If your site is mobile-friendly, a ‘Mobile-friendly’ tag will appear underneath your URL in mobile SERPs. If this is absent, then that’s an initial red flag for your business, indicating that you may be at risk from a drop in rankings and traffic come 21st April 2015. If your site is mobile-friendly, a ‘Mobile-friendly’ tag will appear underneath your URL in mobile SERPs. Task 2: Are you still using a desktop configuration for your mobile site? If you failed to receive a ‘Mobile-friendly’ label above, this will be why. Currently, your desktop site is being rendered on mobile and Google deem this as a blanket poor user experience. And rightly so, simply replicating your desktop site on mobile brings a whole host of usability issues to your users. From pinching the screen to zoom in to scrolling horizontally to see content beyond the screen, you’re making your users work. Filling in that contact form or completing that checkout process shouldn’t be a laborious task, but by giving users an experience that isn’t optimised for their device, it intrinsically is. Google have openly stated how their personal preference is responsive design when it comes to mobile configuration. 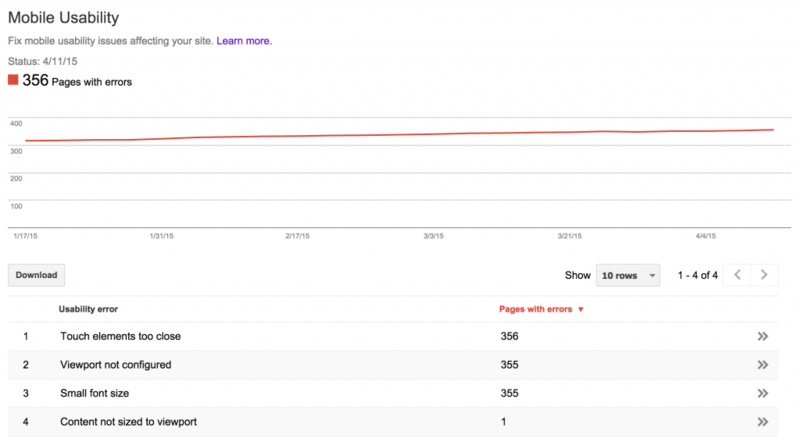 Task 3: Are you receiving a high number of Mobile Usability Errors in Google Webmaster Tools? Here’s a quick exercise you can do to see which exact pages of your site are in jeopardy from the mobile update. Head over to your site’s Google Webmaster Tools account and login. Click ‘Search Traffic’ on the sidebar navigation menu and access ‘Mobile Usability’. This will present to you the Mobile Usability errors Google has detected on your site, if any. Google looks at 4 possible errors in particular, namely, your touch elements being too close together, your viewport not being configured correctly, your font size being too small and your content not being sized to viewport properly. Any pages detected with these errors will be counted here. You can also click on each error. This will provide you with a more detailed explanation of exactly what the error looks at and which pages are currently being affected. Google allows you to download CSVs at a granular level here, regardless of whether you’re looking at one error or all of them, so make sure to take advantage of this function. Above: A website that uses an adaptive configuration for their mobile site, still being presented with 365 Mobile Usability page errors. It is important to note that even if you use a mobile-friendly configuration, you’re not totally out of the woods. The example client given above actually employs an adaptive configuration for their mobile site, yet they’re still receiving Mobile Usability errors from Google. This means that there are still mobile design and development considerations to be made and they’re simply less at risk from a decrease in metrics when the mobile update arrives. For a more comprehensive list of design considerations when converting to mobile, use our Mobile Optimisation Checklist. Following these checks closely will ensure your site is properly mobile optimised and will avoid any usability errors appearing in Webmaster Tools. Task 4: Are you ranking ‘Red’ or ‘Amber’ for Mobile Speed and User Experience in Google’s PageSpeed Insights Tools? Mobile page speed is another metric you can look into when examining how at risk you are from the mobile update. The rationale here is simple; if all other factors remain the same, a mobile site that loads quicker than yours will rank higher on mobile SERPs. As always with Google, it’s all about providing a good user experience. A site that loads quickly provides the user with a fluid and non-clunky web experience; something Google strive for when providing their own services. If all other factors remain the same, a mobile site that loads quicker than yours will rank higher on mobile SERPs. To calculate your mobile page speed and user experience score, use Google’s PageSpeed Insights tool. This tool only works at page level, so you’ll want to examine your key landing pages first. 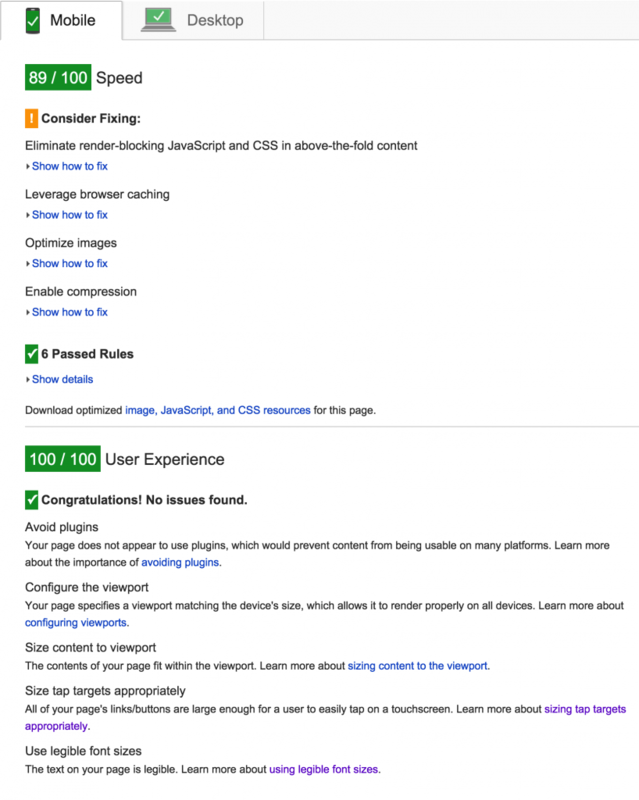 Access the ‘Mobile’ tab to find out what score out of a hundred Google has rated your site. The score you receive will then dictate your colour rank. Whilst green indicates that Google couldn’t find any significant issues, red and amber suggests that there are some issues that need resolving. Work through the list of actionable points to help improve your overall mobile site speed and user experience. Above: a site that scores significantly well for mobile page speed and user experience, leaving very few actions for the Webmaster to implement. Task 5: Have you calculated the total amount of non-branded organic sessions at risk? By now, you would have established whether you’re at risk from being affected by the mobile-friendly algorithm update. However, we’re yet to establish what’s at risk. Let’s work through this now. Earlier in the month, Search Engine Roundtable reported how brand searches will not be affected come the mobile-friendly algorithm update, leaving many SEOs slightly less worried. However, what now remains is the arguably larger issue of non-branded search queries – an area that undoubtedly accounts for a more significant portion of your organic traffic. Completing this task will therefore give you an approximate indication of the level of mobile traffic you may have at risk from non-branded search queries, come 21st April 2015. Step 1: Calculate the percentage of non-branded mobile search queries accessing your site. To begin with, you need to access the ‘Search Queries’ section of your Webmaster Tools account. This can be found under ‘Search Traffic’ on the side bar navigation menu. Set your date range for the past month and change the filter to ‘mobile’. Download this data as a CSV and make a note of the total amount of search queries – this will come in handy when we start working out percentages. Start by separating out branded search terms from non-branded search terms and count how many there are of each. You’ll now be able to work out the percentage of how much non-branded organic traffic accesses your site, i.e. number of non-branded search queries/total number of search queries x 100. Step 2: Calculate the amount of organic mobile traffic accessing the site from Google. The next step is to access Google Analytics to find out how much Google organic traffic accessed your site within the same time period on mobile. You can do this by setting the same date range and then clicking ‘Acquisition’, ‘All Traffic’ then ‘Source/Medium’ from the side bar navigation menu. You’re then looking for ‘google/organic’. By adding ‘Device Category’ as a secondary dimension you will now see how organic traffic from Google was segmented by device, i.e. mobile, desktop and tablet. Make a note of the mobile value. Step 3: Calculating the amount of Google organic sessions at risk on mobile. Finally, multiply the percentage of non-branded search queries accessing your site with the amount of Google organic traffic you received on mobile. Et voilà! You have completed the task. The result is your maximum amount of traffic that’s potentially in jeopardy when the mobile update arrives. Remember, this is only an approximate indication of what’s potentially at stake. Like regular SEO, mobile SEO will also rely on several ranking factors including what your competitors are doing but nevertheless, this exercise should give you some insight into what we’re dealing with here. Working through these 5 tasks will help you determine how at risk your mobile site is when the mobile-friendly algorithm launches. If most of your results are negative, i.e. you don’t see a mobile-friendly label in mobile SERPs, you have a high number of mobile usability errors and you have a red or amber rating for site speed and user experience, then your mobile search performance is very likely to be impacted. Conversely, if only some of your results are negative, i.e. you have a mobile-friendly label but you’re also still receiving some mobile usability errors, then you’re likely to be impacted, but relatively less so in comparison. The key here is to have some form of a mobile configuration in place, ideally a responsive one. It’s not an all-or-nothing arrangement either. Google determines mobile-friendliness at page level so even if you organise for your key landing pages to first make the transition into responsive design, this will help subsidise any decreases in mobile rankings and traffic. If you’re active on Google AdWords then you can consider increasing your media spend on here also. This will further help subsidise any potential impact whilst you organise the transition into a responsive design. 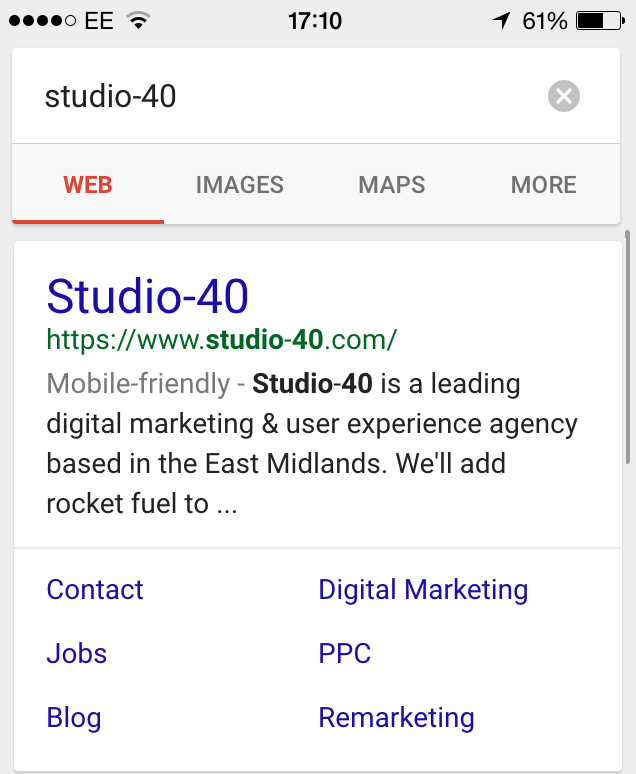 If you’re still unsure about how at risk you are from the mobile-friendly algorithm update, get in touch with Studio-40 today for a full mobile SEO audit today. Highly skilled and experienced SEO practitioner managing a variety of customer accounts and projects.